Innovative Manufacturing is the beating heart of almost every business, and companies are constantly searching for new ways to bring their products from design to market. Boeing is looking to the world's centers of education to make sure it is grooming the best talent at a grassroots level. William E. Boeing opened his first airplane factory on the site of the former Heath's Shipyard, Seattle, in 1910. The company became The Boeing Airplane Company in 1917 as the US entered World War I, thriving during this time, and supplying the military with huge quantities of its aircraft. It created the first of its famous 47 commercial planes in 1933, and the B-52 military bomber in the late 1940s. Today, Boeing is one of the world's largest companies and employs over 150,000 people. With revenues of $94,571 million, it is placed at #24 on the Fortune 500. Sheffield, UK, was once a busy center of manufacturing for the country. Though the heady days of the region's steel production are long gone, Sheffield is still home to a prestigious university and a rich manufacturing heritage. It is this growing pool of talent which Boeing is looking to tap into, and the reason Sheffield was chosen as the site for its high-tech innovative manufacturing plant. The fabrication facility represents an investment of $40 million, and is the company's first manufacturing center in Europe. Designed with data in mind, the facility has a mission statement of first-class efficiency without a compromise on quality. The thousands of sensors throughout the facility allow production to be closely monitored, machine uptime adjusted, and real-time results assessed from any location in the world. "This is a smart factory equipped to take advantage of what we call industry 4.0 - the capturing and applying of data insights to make systems work perfectly," says James Needham, Senior Operations Manager for Boeing Sheffield. "The facility will employ about 30 people, including 19 apprentices who will receive first-class on-the-job training. The parts we will make are very small and will be machined in under 30 minutes on approximately 20 machining centers, which will allow us to make thousands of parts at full capacity, which is a number more usually associated with the automotive industry than aerospace. Demand is high, so it's important to focus on efficiency." The factory is located on the same site as the University of Sheffield's Advanced Manufacturing Research Centre - a world-class machining and materials research facility also part-funded by Boeing. 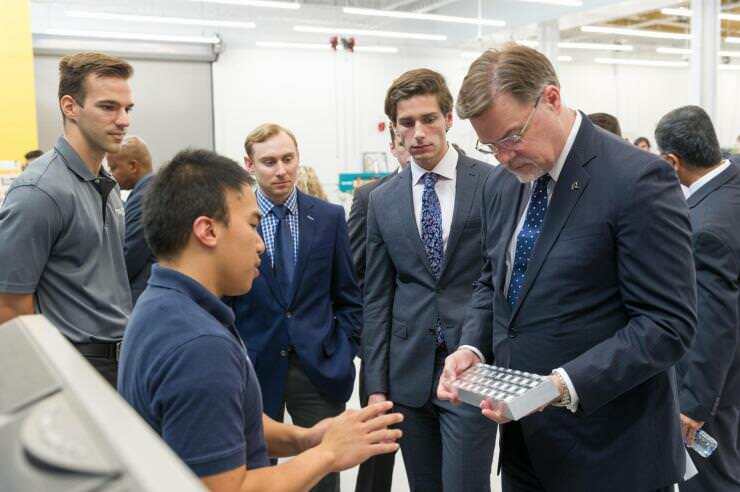 Not content with its investment in innovative manufacturing solutions in the UK, Boeing has also announced a new research center to be opened at Georgia Tech. The new Boeing Manufacturing Development Centre site will bring together the company's own researchers with the university's engineering students to solve some of the industry's most pressing challenges, with a specific focus on automation. 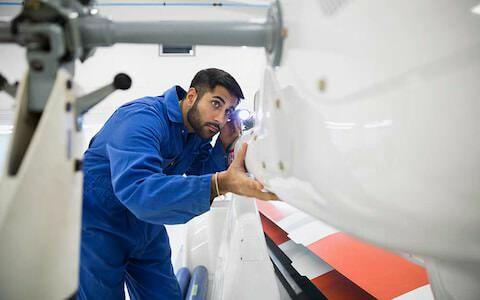 For example, one of the first projects to be undertaken at the facility will be developing new industrial robotics and applying them to Boeing's manufacturing processes. "Georgia Tech's long and productive relationship with Boeing includes immersive educational support for our students, collaborative research, and development of aerospace innovations," said Steve Cross, Georgia Tech Executive Vice President for Research. "Our relationship is an exemplar for industry-university engagement as we meet jointly shared aspirations for the future of education and the advancement of technology." Previous technology which has come out of Boeing's relationship with Georgia Tech has included developing control systems on cranes, mobile platforms and robotics for moving parts in a factory environment, and active flow control for aircraft wing tips. With the establishment of this new manufacturing innovation center, it's likely we'll see many more exciting developments in the future. It's clear Boeing takes the talent coming out of the world's universities seriously and is looking to build strong relationships with them. From research and lecturing, to apprenticeships and employment, Boeing is making sure they've got the right people in the right places to keep its manufacturing heart beating. The final word goes to Thomas Pledger, a Boeing apprentice, whose family has existed for several generations in South Yorkshire, UK. "We're all very excited to have the opportunity, most of our families worked in the [coal] pits. The AMRC Training Centre has all the best equipment and tools to learn on." You can hear Boeing's Materials, Process, and Physics Engineer, Antonio Paesano PhD speak at Connected Manufacturing 2018 this June in St Louis, Missouri.